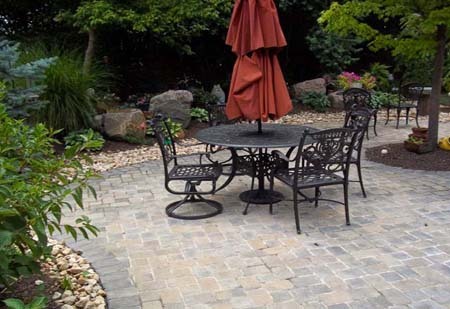 Terracing a patio is a perfect way to adjust for grade changes in your backyard. 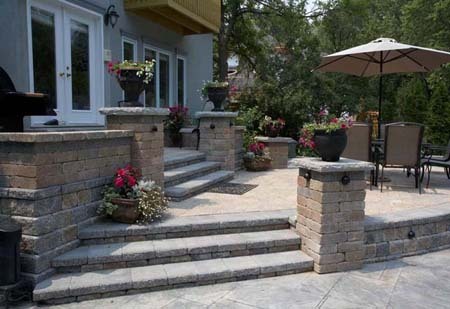 The beautiful stone steps lead you from the lower curvy brick patio to the upper square patio. 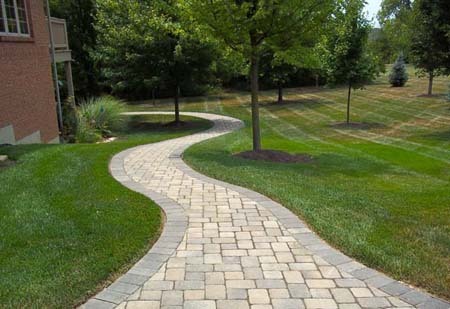 A simple winding brick walkway provides a nice path through a serene landscape garden. The combination of the brick paving stones and the arching steps create a grand entrance to this more simple home. 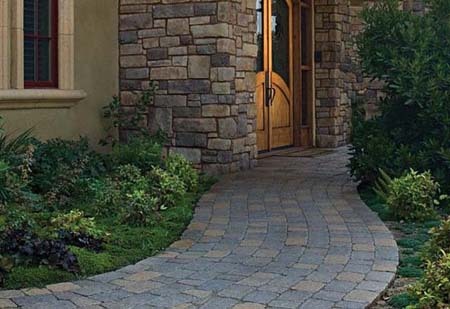 This curvy paver sidewalk is a nice compliment to these terraced stone walls, taking you from the rear brick patio up to the front of this home. 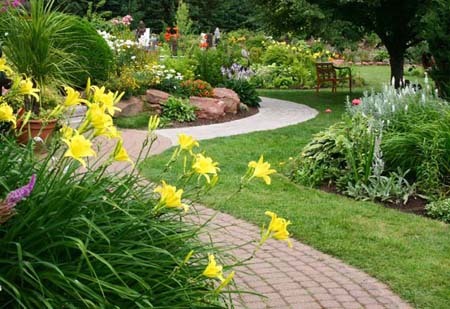 Landscaping around your outdoor living area creates a relaxing element and adds some privacy from your neighbors. 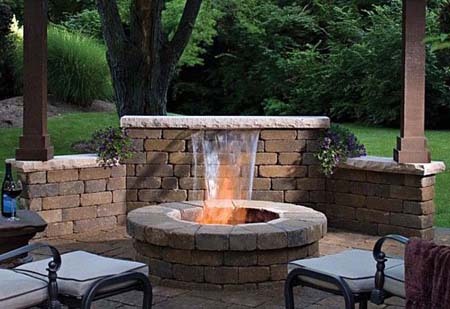 This beautiful stone fire pit area, wrapped with a complimenting seating wall will definitely create some enjoyable memories for this homeowner. 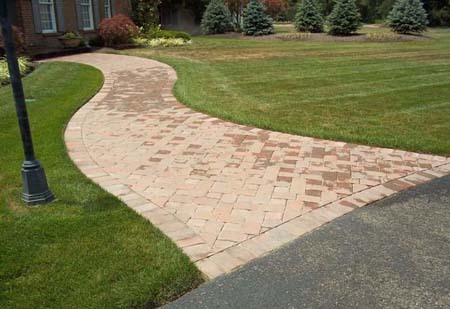 This extra wide brick walkway yields an elegant entrance for guests. 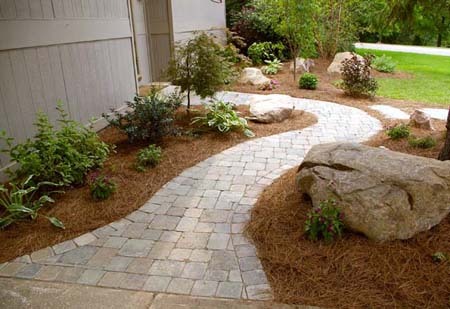 Adding ornamental gravel around your brick patio will keep mulch from blowing and washing onto the patio. 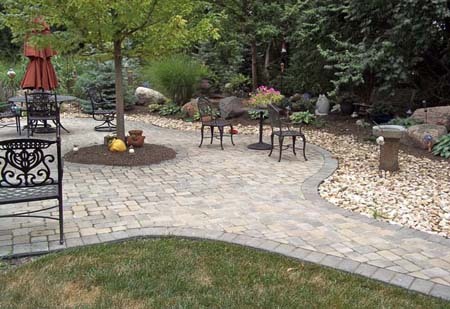 A paved walkway provides a nice access to your rear outdoor living area. 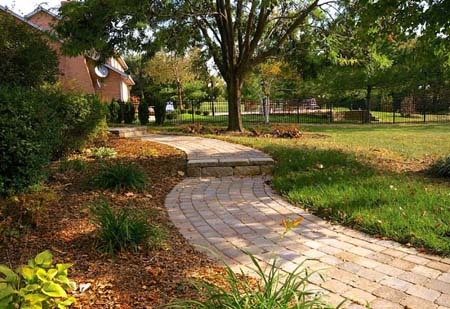 Installing your brick patio around an existing tree will offer some shade and create a unique feature that will impress. 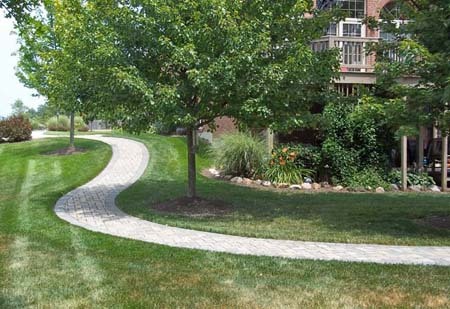 This winding brick walkway weaves between the existing trees taking guests on a stroll to the rear paver patio. 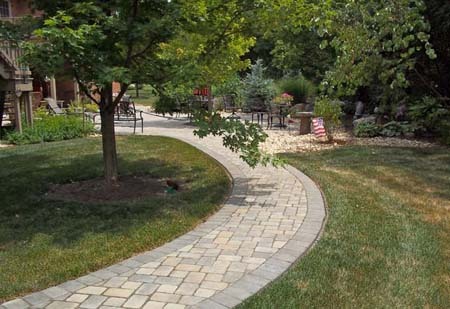 Another view of the winding brick walkway. 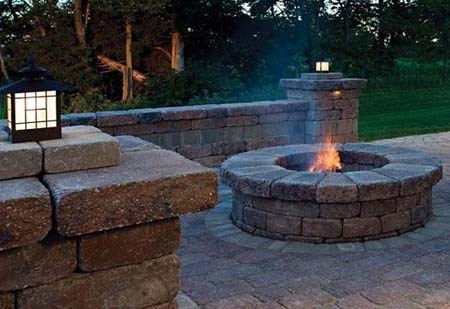 The stone fire pit is the focal point of this large open patio designed for entertaining. 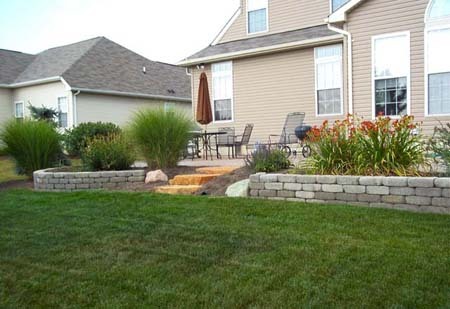 Adding a wall around the perimeter of your patio will allow you to adjust for elevation changes in your yard. 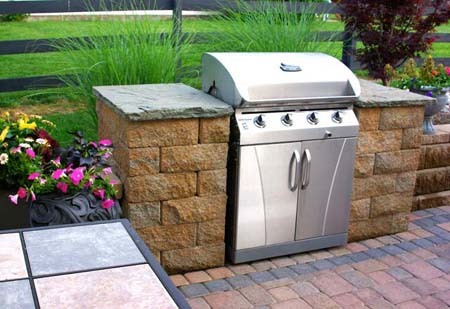 Building a grill station from the same stone as the seating wall yields some uniformity on your brick patio and creates a nice space for food preparation. 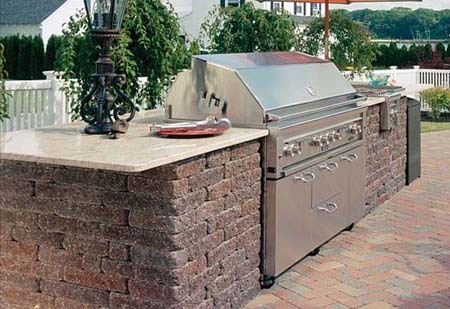 This stand alone outdoor kitchen is constructed around a BBQ grill and features a granite countertop and separate burner for warming side dishes. 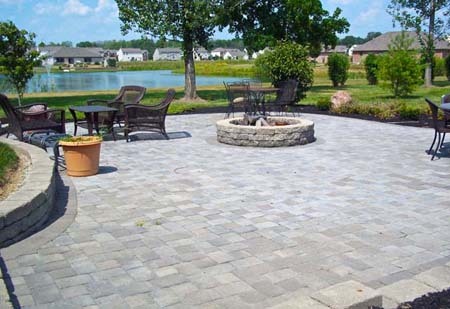 A beautiful and functional element to add to your new brick patio. The combination of the water sound streaming from this unique feature and the warm ambiance produced from the stone fire pit has everything you need for a relaxing evening. 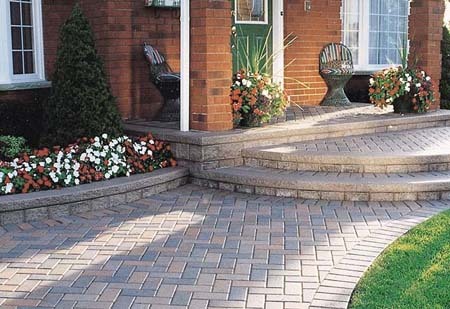 Covering an existing stoop with brick pavers is an affordable way to dress up your entrance. 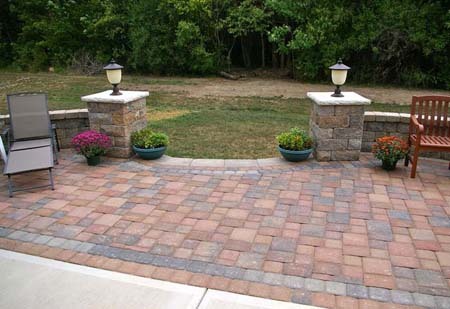 Complimenting the stone columns, this brick walkway provides a warm and elegant entrance to this home. 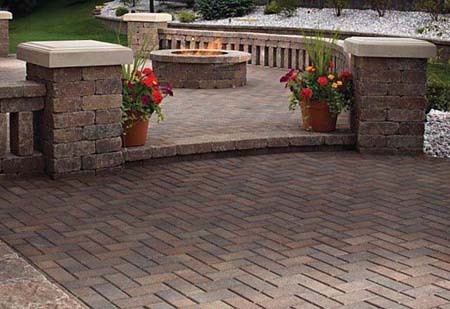 Using multiple size brick pavers laid in a random pattern will give a natural appeal to your patio. 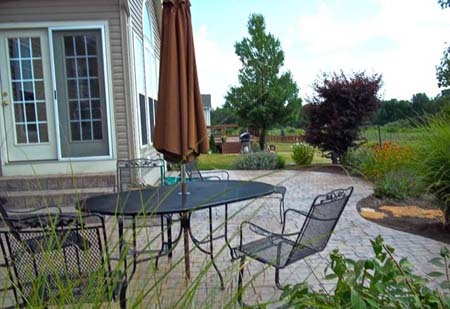 This well designed terraced patio creates space for grilling, outdoor dining and entertaining. 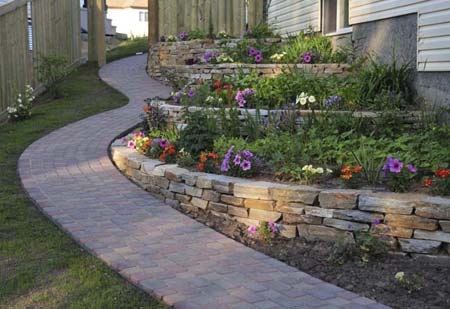 The wide stone steps helps join these spaces aesthetically and functionally. 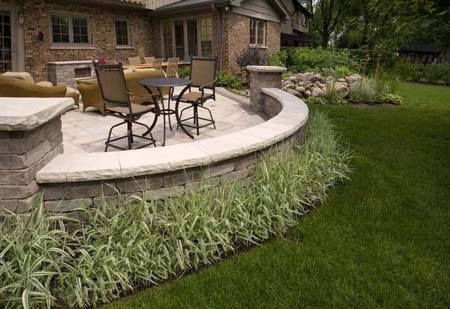 Framing your outdoor dining and fire pit areas with a stone seating wall will provide enclosure and additional overflow seating for guest. 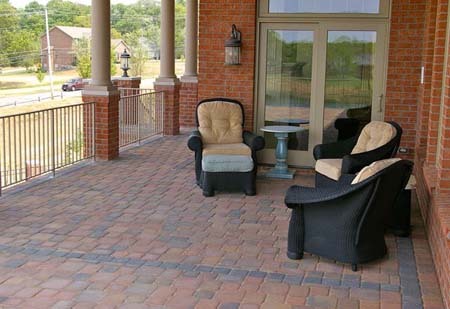 Using warm tones for the brick patio and seating walls yields a beautiful, elegant outdoor living area. The pool, stone fireplace, pergola and large brick patio combined make a perfect backyard get-away. 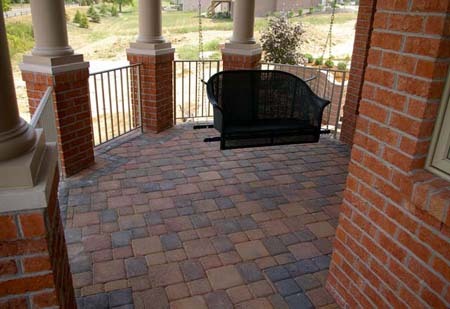 Using neutrally blended pavers with colorful accessories will eliminate competing colors. 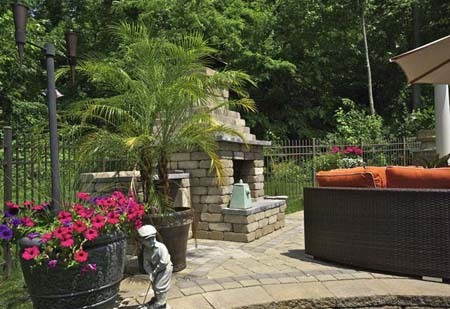 Nestled within the colorful flowers and bright furniture is a stone fireplace that makes this outdoor living area warm and inviting. 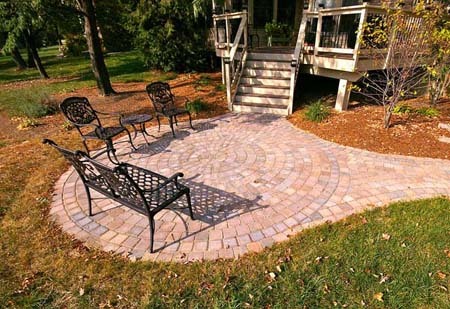 Adding a round brick patio off your deck will compliment the area and provide a nice seating area. 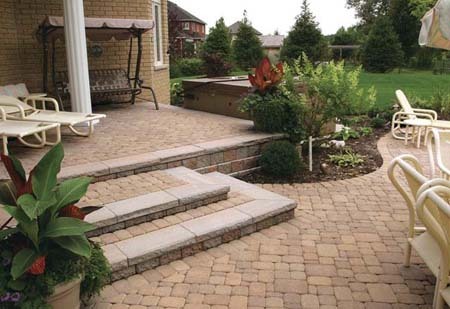 Adding stone steps to your paver walkway will help adjust for elevation changes in your yard. 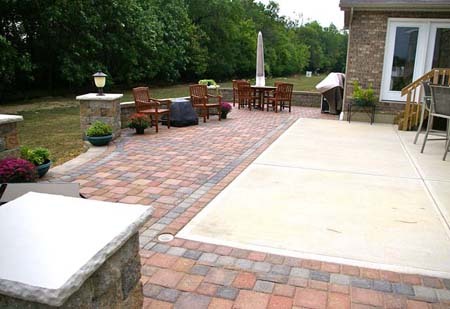 A brick patio addition will add outdoor living space and taste of elegance to your existing patio. 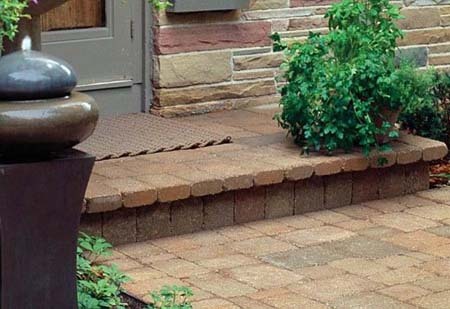 Stone columns create a grand entrance onto your brick patio. It's the simple things that make your time outdoors more relaxing...like a swing. 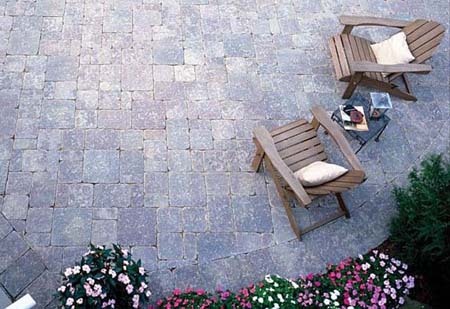 This patio uses contrasting paver borders to distinguish space. Being creative has it's pay off. 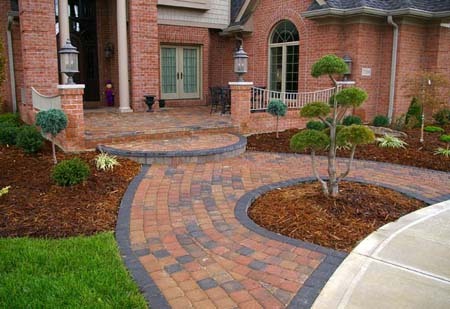 The horseshoe shaped brick walkway adds a unique entrance onto this front courtyard patio. 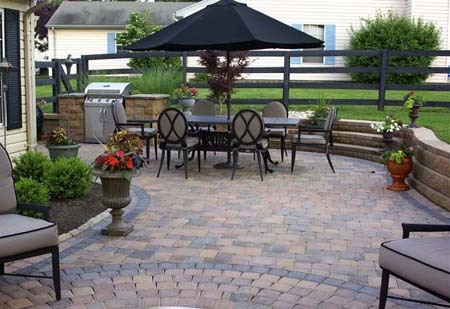 Stone walls can be used to raise a patio, but also can be used to lower a patio. 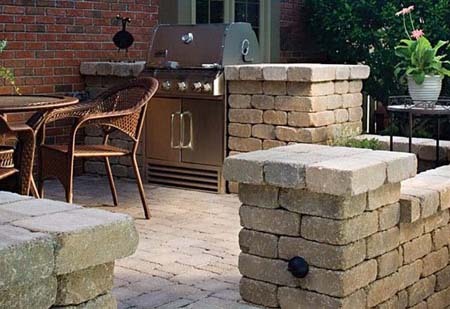 Removing the side burners from this grill allows it slide perfect into this stone surround that provides a nice food preparation area a beautiful element to your patio.